The 2017-18 edition of the Buffalo Sabres was terrible. While winning only 25 of 82 games, the Blue and Gold allowed 81 more goals than they scored—a differential approaching 100 goals more than the worst playoff team. They were dreadful at home and horrible on the road. They finished dead last in the standings. Their biggest accomplishment was driving their passionate fanbase from disgust to outright apathy. 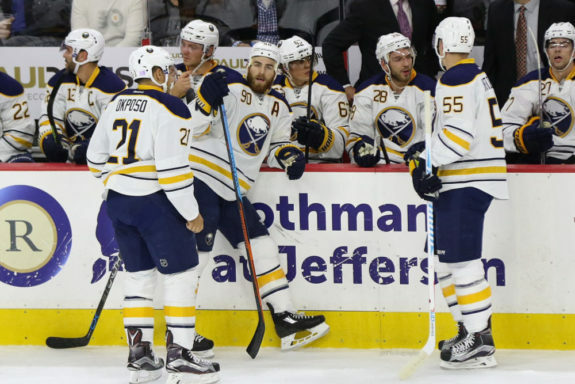 The 2018-19 version of the Buffalo Sabres has only one certainty: the outcome of the season is entirely unpredictable. Going into training camp in a few weeks, enthusiasm has been rekindled with the arrival of the No. 1 overall draft pick, defenseman Rasmus Dahlin. Former Minnesota Mr. Hockey, 19-year-old Casey Mittelstadt, will begin the year by playing his seventh NHL game. There are three additions from the Ryan O’Reilly trade with the St. Louis Blues. And there have been a number of departures that sophomore general manager Jason Botterill hopes will prove to be addition by subtraction. All told, of the 23 roster spots, at least 11 will be filled by players who were not in the opening-night lineup last season. Botterill promised change, and Buffalo got it. Looking into a dim, cracked crystal ball provides views of a horror story best told at midnight on Halloween. This prediction includes everything going wrong that practically could, except injury. In this scenario, Botterill makes no more moves and has left the turn-around up to second-year head coach Phil Housley and the players. The top line struggles as Jack Eichel’s development into a superstar stalls. The bitterness of non-stop firehose-to-the-face losing gets the best of him. Sabres fans see flashes of his brilliance but those get lost in the gloom of his fourth sub-65 point season. His likely wingers—the recently acquired Conor Sheary and still unsigned RFA Sam Reinhart—prove that they have no business on the first line. 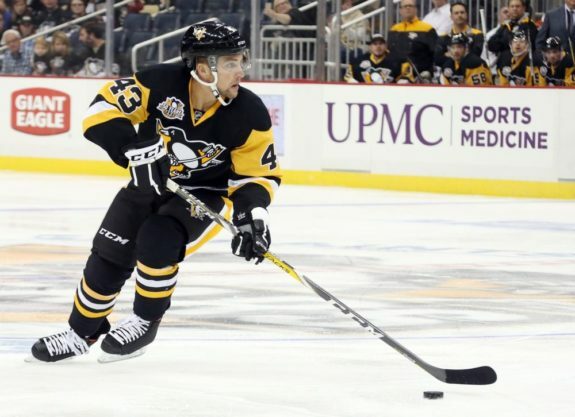 Sheary manages only 17 goals while being knocked off the puck so many times that fans mistake him for Tyler Ennis. Reinhart is the player of last year’s first half rather than the second, contributing a measly 15 goals and 25 assists for the whole campaign. The second line, led by Casey Mittelstadt, equals the first in futility. The still undersized young center finds that while he is able to score at nearly 0.75 points per game, he struggles with NHL-level defensive responsibilities. On his right side, Kyle Okposo continues his downward slide from 22 goals in 2015 to 19 goals in 2016 to 15 last year and even fewer this season. Fans half-heartedly joke that he and Matt Moulson have never been seen in the same place at the same time. The left wing on this second line sees a rotation of junior, college and foreign league players that can’t seem to make it work in the NHL. Evan Rodrigues, C.J. Smith, and former Blues first-round draft pick Tage Thompson prove that they are not the answer, consistently missing from the score sheet more than appearing. Vladimir Sobotka shows the fans why the Blues labeled him a slowing, aging, overpriced veteran. 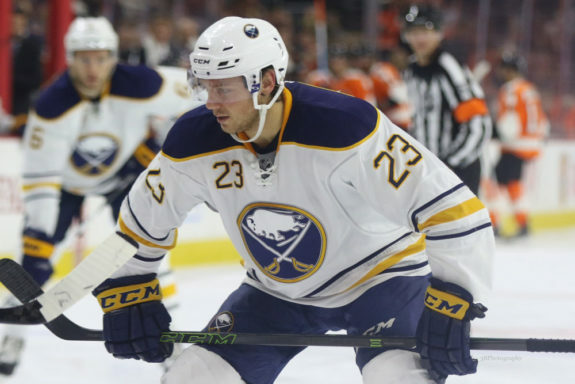 Scott Wilson and even Johan Larsson are temporarily given the job in order to stanch the steady stream of pucks headed into the Sabres’ net while this line is on the ice. Victor Olofsson is finally given his shot, but by then, the Sabres are 30 points from a playoff spot with just 12 games remaining in the season. Other forwards do just well enough to cement their career positions in Rochester—or elsewhere, perhaps selling insurance or used office furniture. Justin Bailey, Nicholas Baptiste, Zemgus Girgensons and Patrick Berglund either don’t have anything left to contribute or never did in the first place. Call-ups Cliff Pu, Sean Malone, Rasmus Asplund, Andrew Oglevie and others struggle to produce given third and fourth-line duties and minutes. 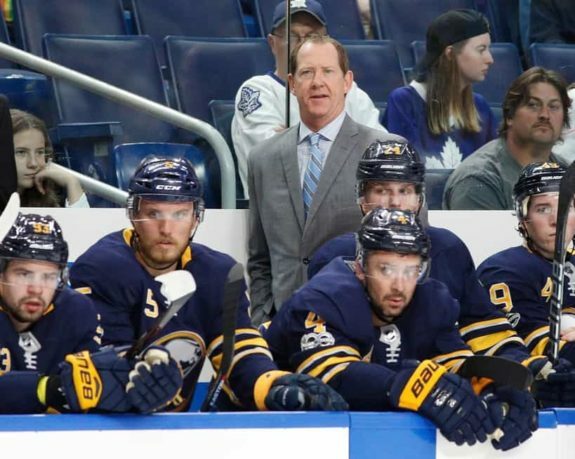 Phil Housley seems even more in over his head than ever when it comes to the defense. 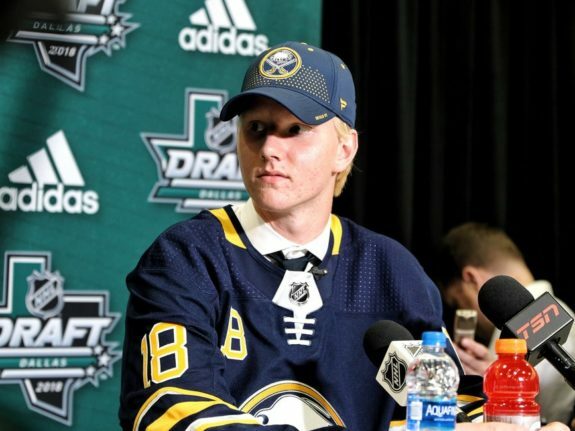 Rasmus Dahlin is asked to play nearly 25 minutes per game. He isn’t ready for it. Rasmus Ristolainen is also asked to play huge minutes. And, as usual, he is terrific until that 24th minute comes, bringing with it positional mistakes, poor choices and errant passes. Marco Scandella is the octopus with one tentacled arm plugging each crack in the dam. The problem arises midseason when the dam’s holes number in the twenties. Good-spirited Zach Bogosian can’t help much as his body has seen too many battles and injuries to be effective. The rest of the defense is either too young, too inexperienced or too mediocre to contribute. In goal, Carter Hutton and Linus Ullmark play well but never seem capable of stepping up to steal games or make the big saves when the team in front of them fails. It’s impossible to tell if they are the real deal trying to backstop the repeat worst team in the league or if they both reach their potential at back-up level. The year ends with no improvement in the standings over the previous year, almost the exact same goal differential and Terry Pegula with his finger on the fire-the-front-office trigger. Western New Yorkers’ hopes, once again, are dashed. The Leafs win the Cup. The Anchor Bar burns in a horrific fire. The newly developed waterfront goes belly up. And the Niagara Falls dries up in a tragic environmental disaster. On the flip side, looking into a brand new, spit-glossed crystal ball is considerably more upbeat. In this vision, nearly everything that can go right does. Players develop, chemistry ensues and Housley’s system comes to life. A re-invigorated Jack Eichel chases a 100-point and MVP season centering two dynamic young players, Reinhart and Sheary. The new captain, Eichel, helps Reinhart surpass the value of his new contract. Sheary finds unexpected life and chemistry with his new teammates. Both Reinhart and Sheary play well at even strength and excel on the power play. They both net 30 goals and finish with close to 60 points. Playing behind Eichel, Casey Mittelstadt is protected even though he proves that there is no need. The dynamic youngster’s vision, speed and skill shine. His 76 points earn him second place in Calder Memorial Trophy voting for best rookie. Kyle Okposo plays on his right side and has the bounce-back season that the Blue and Gold faithful had hoped. Okposo tallies 25 goals and 30 assists even as he shares this spot in the second half with the emerging and tenacious Cliff Pu. On the left, Victor Olofsson proves that he is the gem plucked from the rough. C.J. Smith shows undeniable talent and passion in pushing Olofsson for that second-line spot. Botterill and Housley realize very quickly which of the young veterans have taken their NHL dream as far as they were able and refuse to let them hold back speedy younger players. Only Jason Pominville and Scott Wilson are kept as mentors for the kids while they contribute on the penalty kill. On the blue line, Rasmus Dahlin lives up to all the hype; he is rock-solid on defense and contributes 55-60 points on offense. He beats out teammate Mittelstadt to become the Sabres’ first Calder winner since Tyler Myers a decade hence. The underrated Marco Scandella is a steadying force and mentor for the young Swede and, in fact, for the whole defensive corps. Rasmus Ristolainen’s minutes are cut back to 23-24 per game. He has a career year both in plus-minus and co-anchoring one of the league’s most potent power play units. Zach Bogosian stays healthy, allowing for him to come through as a dependable bulldog. Brendan Guhle and Casey Nelson continue to improve, perhaps the best third pairing in the league. Jake McCabe is able and willing to fill the seventh spot, a reliable substitute when fatigue and injury slows one of the top six. Lawrence Pilot’s play dares Housley to keep him out of the line-up. Carter Hutton shows Buffalo and the NHL that his rise hasn’t been a quick flash in the pan, rather, a slow and steady rise to the elite. He plays with confidence while cutting down the angles. He covers for the occasional defensive breakdown and while steadily keeping the softies to a rare minimum. Linus Ullmark plays 31 games in relief and posts a 2.33 goals-against average and a .922 save percentage. 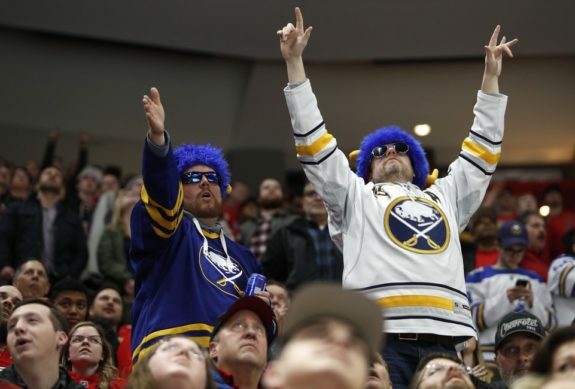 The Sabres score 60 goals more than last season and allow 40 fewer on the way to 94 points and their first playoff bid in what seems to most fans as 1,000 years. The Bills also make the playoffs. The Leafs miss the playoffs. Potholes disappear in Western New York. And Amazon decides to move their eastern headquarters to Niagara Street. Where Will the Sabres Finish? The reality is that the 2018-19 edition of the Sabres will likely land somewhere in between these extremes. Some players will find success while others will struggle. There will be streaks of good and bad. And injuries, an unfortunate part of the game, will happen. However, one thing is certain. Regardless of where they finish in the standings, there will be new life and enthusiasm in Sabredom once again.